In this article we will discuss the similarities and differences between the 3 “First Hop Redundancy” protocols supported by Cisco devices. These are Hot Standby Router Protocol (HSRP), Virtual Router Redundancy Protocol (VRRP) and Gateway Load Balancing Protocol (GLBP). The main purpose of the above protocols is to provide redundancy to the default gateway (router or Layer3 switch) in a LAN environment. Usually in a LAN we configure a default gateway IP on all users’ computers in order to reach the Internet (or other networks). What if this default gateway (which is usually a router) fails? This means that Internet connectivity will be lost for the whole network. The protocols we will discuss here provide automated switchover of the default gateway IP address to a second routing device so that to have uninterruptible connectivity in case the primary device breaks down. 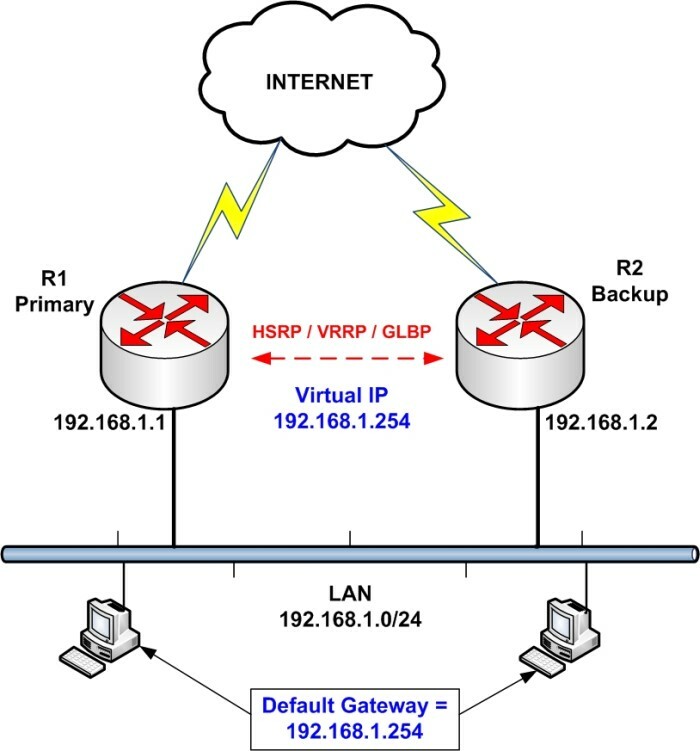 Although the above is the most commonly used scenario, we can also use HSRP/VRRP/GLBP in conjunction with some other mechanisms and protocols (such as BGP for example) to implement ISP redundancy (Dual WAN connectivity). However in this particular article we’ll just discuss a simple implementation of providing redundancy to two routers in a LAN and provide comparison of VRRP Vs HSRP Vs GLBP which are supported by Cisco. In our simple network above, we want to provide redundancy to the border routers (R1 and R2) which connect users to the Internet. By configuring one of the redundancy protocols (HSRP, VRRP, GLBP) we can achieve just that. Each router has its own IP configured to its LAN interface (192.168.1.1 on R1 and 192.168.1.2 on R2). However, a Virtual IP (192.168.1.254) will also exist which will serve as the default gateway for the whole LAN. No matter which router is active or if we have one failed router, the Virtual IP will still exist in order to route packets from the users. Now let’s move to the main purpose of this article: To see similarities and differences between the 3 protocols. I’ll just state briefly some comparison points below and then use a table to compare more features. HSRP and VRRP are very similar. Both have one active and one standby router at any given time. GLBP is the only one which provides load balancing of traffic among the devices in the group. HSRP and GLBP are Cisco proprietary. VRRP is an IETF standard (RFC 3768) so it is supported by all router vendors. If you have a mixed vendor environment (e.g Cisco, Juniper etc) than its better to use VRRP. All protocols support more than 2 routers in a group. All protocols support tracking. This means that you can track an interface of the router (or other network conditions) and if something goes wrong (e.g interface goes down or a destination tracked host does not respond) then a failover action is triggered. HSRP and GLBP support IPv6. The original VRRP does not support IPv6 but you need a special version of VRRPv3 for this. Must configure a separate IP for the Virtual. Virtual IP can be same as physical IP of one of the routers Must configure a separate IP for the Virtual. Higher priority (above 100) makes router active. Otherwise, higher IP makes router active. Higher priority (above 100) makes router active. Otherwise, higher IP makes router active. Higher priority (above 100) makes router primary forwarder. Otherwise, higher IP makes router primary forwarder. If your network contains only Cisco devices, then I suggest to use HSRP. It works pretty well and is well supported. Now, if you have other vendors in your network or you are planning to install devices from other vendors in the future, then VRRP is the way to go.